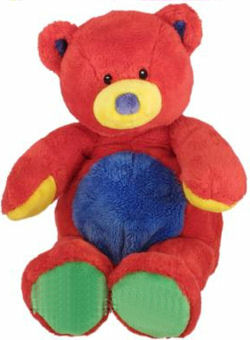 I’m searching for a baby Gund RED Tutti Frutti bear. Our son lost his when we let him pack his own bag when we returned from a recent vacation. It has been his favorite toy since he was born. We have searched high and low on eBay, the internet, and other venues without success. We found ONE web site that listed one, but we can’t get in touch with them and fear that the store is no longer in business, even though the pages remain. The item number on the tag is either 58320 or G58320. There is a newer version of this red bear available, but it looks different than the one we need. There are also several BLUE versions of this bear available on eBay, but no red ones. The current story is that “Red Bear” wanted to have an extra vacation, but we are not sure how much long that excuse will hold up. There is a web site called www.toysplus.com that has one listed. We tried to buy it, but we have not been able to reach them. Our only hope now appears to be either a place like this, a thrift shop, or a possible sale on eBay. We have been watching but have not been successful. We have also found one on a website in Japan, and we are working with friends who speak Japanese and have contacts there to try to get it. If you can help Charles find this Baby GUND Tutti Frutti Red Bear with Green Feet, THIS SITE IS NO LONGER ACTIVELY MANAGED. Please use Our FREE FACEBOOK GROUP, including #092008-4 in the subject, . That’s not it Liza. You found the one with the big feet. She’s looking for a regular shaped bear. ‘I found a Blue bear on e-bay auction number 58321. Right bear, just wrong color. While I was searching for you I kept running across all the different places you posted. Have you tried contacting the company directly? You probably already tried contacting the place where your son left it. Sorry I couldn’t help more. Good luck on your search, hope you find the bear soon! Is this specific Baby Gund a rare one because I bought the exact same one you have posted for my fiance back in September. I don’t know if it’s rare or not, but the particular version that Charles was looking for had eluded him. It took our searchers about a month before the right one was spotted. I’m curious as to why you are asking. I got mine from a girl who comes around to the restaurants in our area and sells teddy bears and flower. If its not a rare one could always see if she could get another one. Mine is exactly the same one as the one in the picture. Have you found your sons yet? HI again. This one has been found. You can tell the difference because I change the Searching – in the title to FOUND. That being said, Charles might like a backup if you can get one. Please use the Contact Us link, so I can forward your email to him.